The Premier League in 2013-14 will again be a melting point of nations, with players from 67 countries currently represented within the first-team squads of the 20 clubs ahead of the start of the new season on 17 August. A graphical representation of where these players comes from is on the left, and you can click on the image to enlarge it and see it in greater detail. Things will change on a daily basis with players leaving and others coming to the league for the first time. But this snapshot gives a good idea of the diversity this season. Victor Wanyama will become the first Kenyan to play Premier League football when he makes his Southampton debut. You can read a feature about the extraordinary teacher who put him on his path to success – a 48-year-old mother of six from Nairobi called Sophie Makoba – in the Mail on Sunday (below right, and link here). Kenya will become the 100th ‘foreign’ country (aside from the four Home Nations of England, Scotland, Wales and Northern Ireland) to have an international player appearing in Premier League history, i.e. since the English top division was revamped in the 1992-93 season. English players are biggest single group in the Premier League today: 207 of 566 players (36.6 per cent) are English. They are followed by Spanish players and French players (32 of each, 5.7 per cent each), then Irish (Republic) players (29 of them, 5.1 per cent), Scottish players (24, 4.2 per cent), Welsh (21, 3.7 per cent), Dutch (15, 2.7 per cent), Belgian (14. 2.5 per cent), Brazilian (14, 2.5 per cent), Northern Irish (11, 1.9 per cent) and German (10, 1.8 per cent). 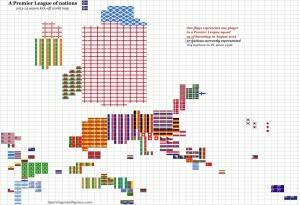 The breakdown of nationalities per club is laid out in the graphic below. 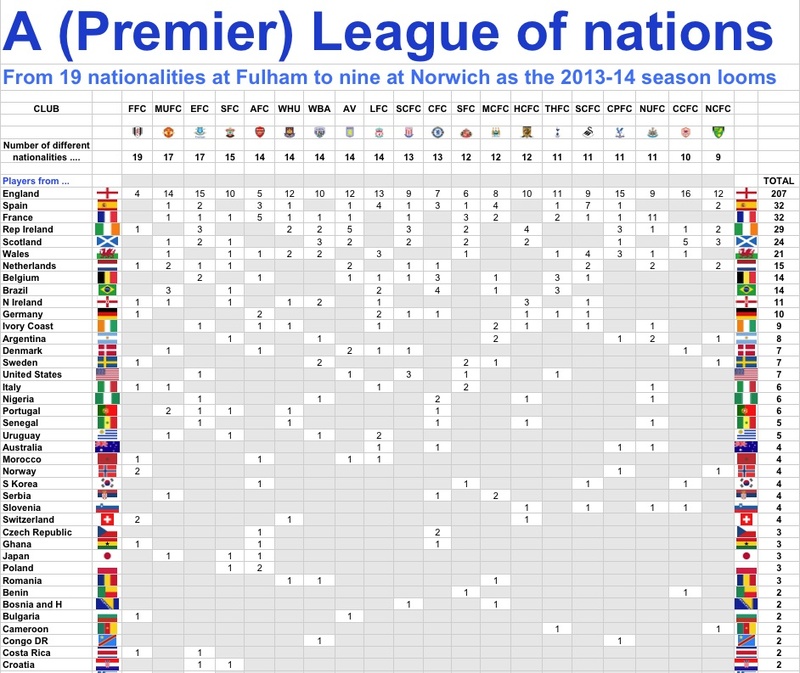 Fulham have the most different nationalities in their first-team squad: 19. Norwich have fewest: nine as things stand. 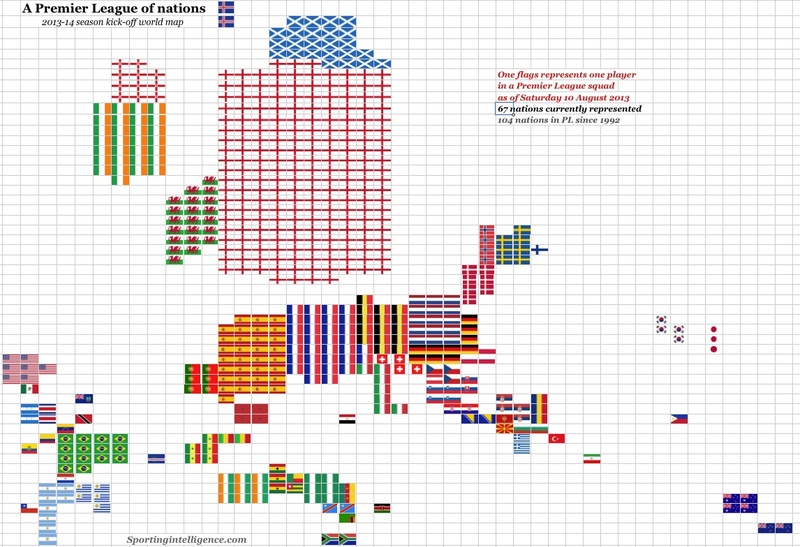 In addition to the 67 current nationalities, 37 others have been represented over the past 21 seasons and they are all listed at the bottom of the graphic. Previous post The legend of Tomashek: 'Fight for the world title?'. 'Naw'. '$2,500'. 'I'm there'.